Bowden cables are a type of flexible cable used to transmit mechanical force or energy by the movement of an inner cable (most commonly of steel or stainless steel) relative to a hollow outer cable housing. The housing is generally of composite construction, consisting of a helical steel wire, often lined with plastic, and with a plastic outer sheath. Bowden Cable is such a broad term it can apply to a number of different applications, ie; Clutch Cables, Throttle Cables, Brake Cable, Valve Control Cable, Handbrake Cable, Go Kart Cable, Bike Cable etc. 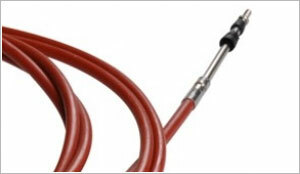 A typical example of a bowden cable would be a bicycle brake cable. 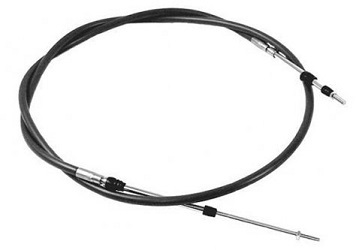 The linear movement of the inner cable is generally used to transmit a pulling force, although for very light applications over shorter distances (such as the remote shutter release cables on mechanical film cameras) a push may also be used. Usually provision is made for adjusting the cable tension using an inline hollow bolt (often called a “barrel adjuster or threaded adjuster”), which lengthens or shortens the cable housing relative to a fixed anchor point. Lengthening the housing (turning the barrel adjuster out) tightens the cable; shortening the housing (turning the barrel adjuster in) loosens the cable. Hindle Controls are able to manufacture any style Bowden cable from a drawing or sample you may have.